In a town as steeped in the past as Whitby you’d expect to find a few pubs with an interesting history and plenty of character but the Black Horse can additionally boast a sympathetically preserved interior, well-kept real ales and (this you may not expect) tapas. The pub is to be found on Church Street in the old town and is handsome, cosy and always bubbling. There are records of a pub at the location as far back as the 18th (or possibly even the 12th) century, although the building also appears to have been a funeral directors and a brothel – though not, you’ll be glad to hear, for many, many years. Most of the interior of the pub dates from a Victorian refit and is kept as unchanged as possible, with comforting bare wood floors and stained glass windows. The back bar is rather more ornate of the two the pub boasts but the front bar can at least claim to be the oldest serving bar in the country. Apparently, standing at the bar to be served (as opposed to waited-on) only became common practice in the 1880’s. Pubs thereafter began building bars as a means of preventing over-refreshed punters groping the waiting staff. The Black Horse is believed to be the earliest surviving example of this new innovation. Today the pub is perfect for a quick couple of pints and a bite to eat while you’re enjoying the delights of Whitby. The drink selection features a choice of Yorkshire ales – a Whitby-brewed beer plus two more regularly rotated guests – and the food is a tempting mix of traditional Spanish and inventive Yorkshire tapas. This means you can go for olives, seafood dishes or Yorkshire cheeses, pork pies or pate made with mackerel from Fortune’s smokehouse. It’s the perfect way to serve simple, tasty food in a pub where space is at a premium. 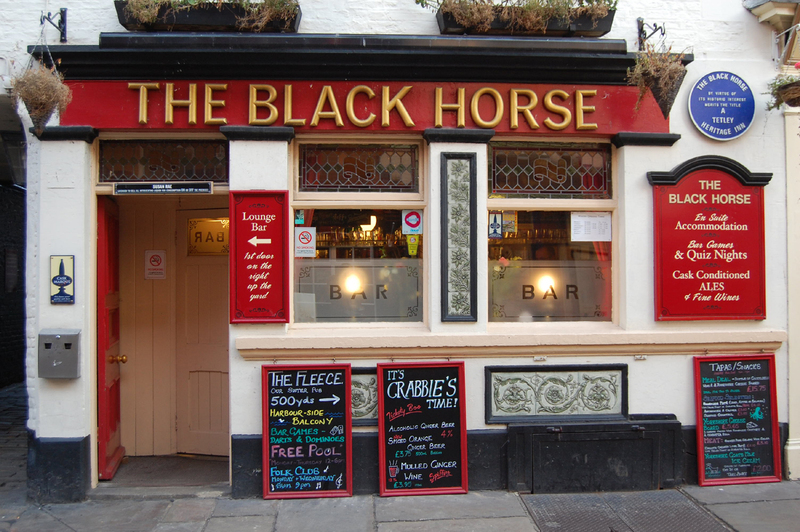 Like all the best pubs, the Black Horse has no pool table, TV or one-armed bandit and as it’s usually filled to the gills with friendly locals and the more savvy tourists you might be lucky to get a seat.